Since her disastrous loss in the Republican primaries last year, Michele Bachmann has kept rather quiet allowing Mitt Romney to garner all the bad publicity (presumably so that she may say "I told you so" to the GOP elite), but recently, Bachmann decided to try and contribute something to the national debate regarding the so-called "fiscal cliff" and score some points with her base. Seizing on news that in an executive order President Obama would allow for congressional pay increases, Bachmann, the principled penny-pinching conservative (who loves collecting federal and state subsidies) sought to block the executive order. There are two things about Bachmann's move. One, while being the most vocal critic, Bachmann was hardly the first to call for the pay hike to not take place. Democratic U.S. Congressman John Barrow beat Bachmann to the punch urging his fellow members of Congress to block the raise alongside him, which it seems Bachmann tried to do (and take credit for). Secondly, Bachmann's move was pointless considering the fact that the Senate's fiscal cliff deal already blocked the automatic pay increases. So basically, Bachmann's attempt to make the news (as well as finally get something with her name passed) was just tea party pillow talk. Oh yeah. 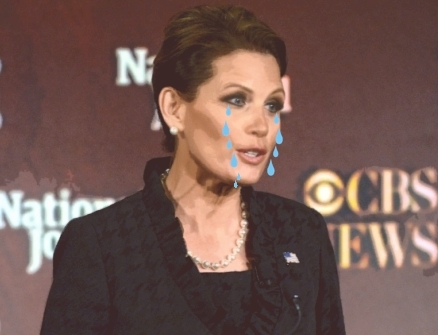 While she pointlessly pushed for provisions to block the pay increases, Bachmann still voted against the compromise. Go figure.